So this is the second eyeshadow palette in the Generation Q collection, and definitely a must have for all lovers of aubergine or plum colors. This palette consists in a liquid metal in Focus, which is a cool metallic brown, and 3 powder eyeshadows: Slink, a gorgeous shimmery champagne, Forgiveness, a matte plum, and Queen of the Night, a gorgeous shimmery blackened plum. Here I used the liquid metal as a base, then Forgiveness on top, Slink in the inner corner but also on top of Forgiveness in the centre of the lid, and Queen of the Night in the outer V.
You could definitely create more drama by using Queen of the Night in a more intense way. Although the powder eyeshadows are beautiful, I find it a little bit sad that there's not pressed pigment in this palette, as I find this is such a cool concept. I also think that this liquid metal is less easy to work with but also less unique than the gorgeous charcoal one in the Empower palette. But all in all, this is a very pretty quad and if you have green eyes or are a purple lover, you are going to love it - for natural or dramatic looks. All eyeshadows are pigmented and easy to work with, as they are in the other palette. 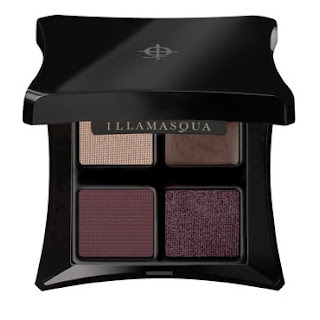 Illamasqua Complement palette - £34. Looks very pretty...I like your hair color!